No, I don’t mean snowboarding either. I don’t ski and I wasn’t keen on taking lessons either, but that hasn’t stopped me from having a wonderful weekend in the snow. I stayed in a town called Mauterndorf, which turned out to be everything a non-skier could hope for, whilst also offering everything someone who does ski could want. Mauterndorf is not a very large town. After the generous amount of snow that fell over the weekend, it looked like a picture on a Christmas card. Aside from a small skiing area, it offers some truly incredible hiking trails. I walked one of these hiking trails and was delighted to find that on parts of the route, the very first footsteps in that day’s snow were my own. The weather was not as clear as I’d hoped, but the path was stunning nonetheless. From Mauterndorf, it takes more than two hours to reach the city of Salzburg by public transport, but it’s well worth the trip. The stunning landscape outside your window will make sure it doesn’t feel like a long trip at all. 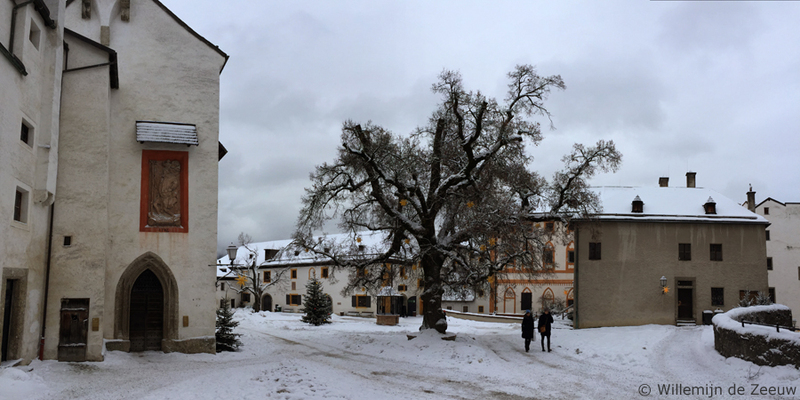 The historic city of Salzburg looks simply magical in winter. I took my time wandering around through the old streets and along the river, before making my way to Salzburg castle Burg Hohensalzburg. The castle – which gave the city its name – looks like it comes straight out of a fairy tale. A funicular railway efficiently transports visitors up the castle hill, where they can wander around the grounds, tour the inside of the castle by audio tour and enjoy the view over the city. Although they’re pretty hard to miss, don’t forget to buy some of the iconic Salzburg chocolates called Mozartkugeln before getting back on the train. Even if you don’t ski, I would highly recommend spending some time near the slopes. Just to see what all the fuss is about. 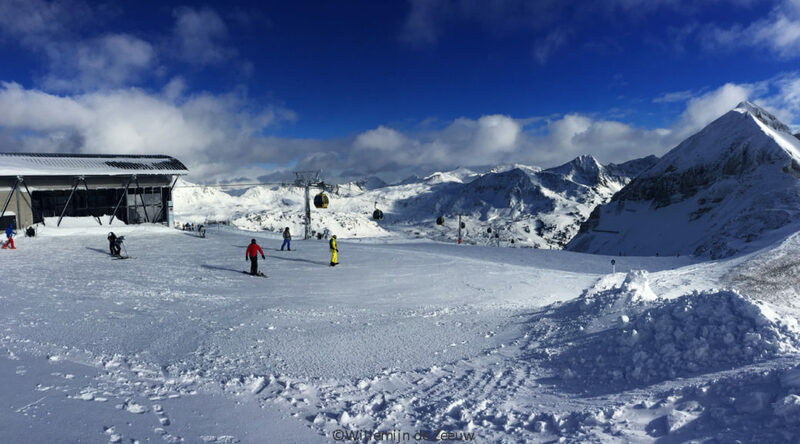 The skiing centre of Obertauern, which offers far more skiing slopes than Mauterndorf, can be reached by bus in about 15 minutes. Unlike in picturesque little Mauterndorf, the entire world seems to revolve around skiing here. There are more hotels, bars and ski schools than normal houses. I couldn’t help but think this place must be a ghost town in summer. The good news however, is that this busy resort offers a great opportunity to enjoy all the aspects of a skiing trip, even if you skip the actual skiing. Take one of the gondolas to the top of the mountain, walk around the town, have a laugh at the overpriced skiing gear in the shops and join the skiers at the après-ski bar for a cold beer or a pear schnapps at the end of the day. Unlike the chair lifts, gondolas will take passengers back down the mountain as well. This offers “foot passengers” a chance to go to the top of the slopes. I particularly enjoyed taking the Zehnerkarbahn, which took me to an altitude of 2200m. On one side of the mountain I could see bits of the village, but after following a gravel path on the other side, the view on that side of the mountain took my breath away. It showed hardly any signs of human activity. Instead, all I saw was mountains, trees and snow. There was quite a lot of wind, which made the temperature of about -15°C feel much colder, but with the wind in my back and the sun on my face, I hardly noticed. I had the view all to myself, as none of the skiers seemed to share my idea of checking out the gravel path, and I couldn’t hear them as they descended the slopes behind me. After my walk I went to the mountaintop restaurant. I took my time writing in my journal and listening to the stories I heard the skiers tell their friends, whilst I warmed myself up with a hot Gulaschsuppe and a cup of tea, before taking the gondola back down to the village.